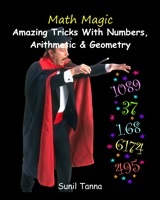 Math Magic: Amazing Tricks With Numbers, Arithmetic and Geometry! This book is a guide to 40 math-based magical tricks. The instructions for each trick explain what props or accessories are needed (for example playing cards or calculator), how the trick appears to the audience, how to perform the trick, and in many cases, the mathematical secrets behind the trick. The book is ideal for magicians looking for something new and different to add to their acts, those who simply want to amaze their friends, and for mathematics teachers and educators who wish to inspire their students with fun and interesting mathematical ideas.